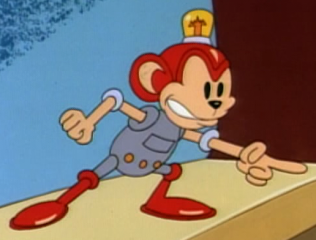 Coconuts is a monkey-robot created by Dr. Robotnik to hunt Sonic in the cartoon Adventures of Sonic the Hedgehog. He used to be one of Dr. Robotnik's more important and devious Sonic-hunting badniks until Scratch and Grounder were created. This event lead Coconuts to be demoted to janitorial duty in Robotnik's base. Hating this job entirely, Coconuts still makes an effort to capture Sonic to try and win Robotnik's favor, in hopes of being promoted again. Being the oldest and more experienced between himself, Scratch and Grounder, Coconuts is usually less prone to fall for most of Sonic's tricks his "brothers" would blindly step into. Coconuts is based off a badnik of the same name. He is voiced by Ian James Corlett. Coconuts is also a character in Dr. Robotnik's Mean Bean Machine, a game which used many characters from Adventures of Sonic the Hedgehog as opponents. He is the fourth opponent in the game, and his AI is based on that of Harpy from the original Puyo Puyo.